Growing cities face many challenges among which are transportation and mobility. These transformations are driven by multiple factors among which are disruptive technologies and local conditions. 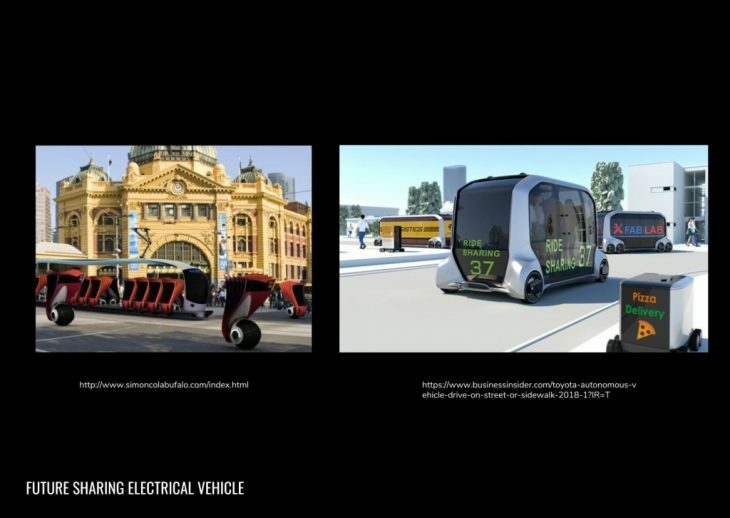 Technological trends will change the mobility industry. One way car sharing vehicles will eliminate as many as 11 cars from the streets. Eighty percent of the top 20 OEM(Original Equipment Manufacturers) are planning to have level 4 automation in there cars by 2025. 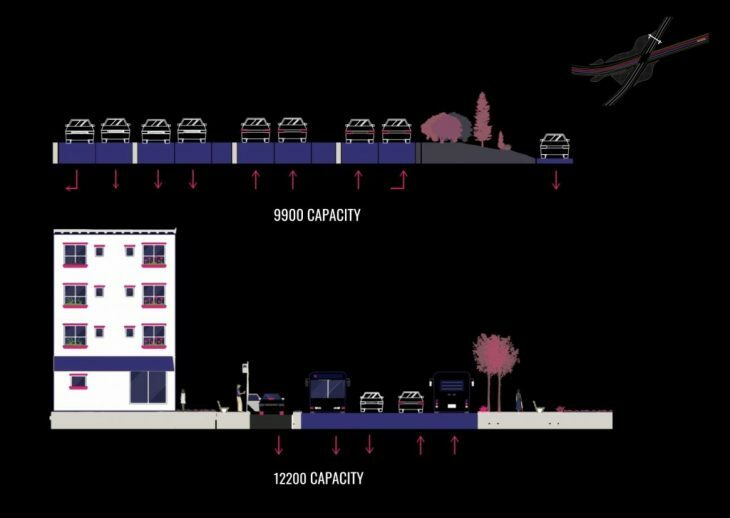 Consequently, people will tend to live further from the city and we will need less parking space. 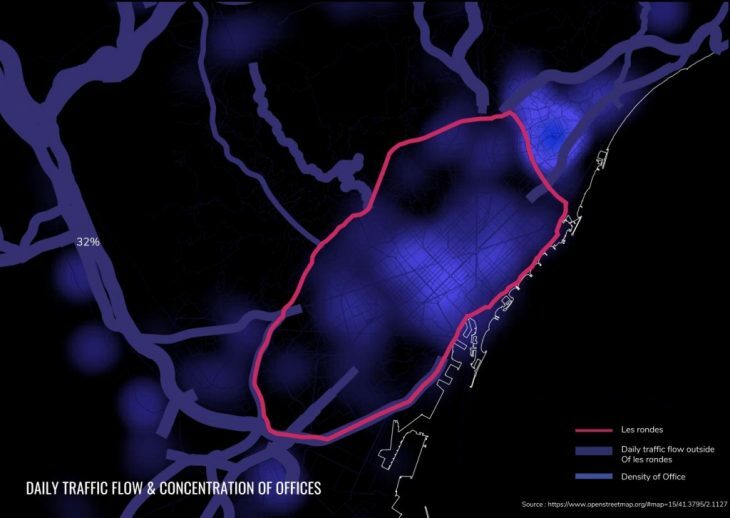 A shift in demography with a change in work behavior will affect where and how the active population commutes. and environmental concerns will drive design and planning. Most companies will have half of their companies full time workforce working remotely. Teleworker drive fewer miles and so reduce carbon emissions solving a art of Barcelona´s critical issues with is the reduction of CO2 emissions. Due to these events, the telecommuting workforce will increase in numbers, With this increase, we will see a shift in peak hour driven mass transportation , a reduction of car purchases and a reduction in road size. 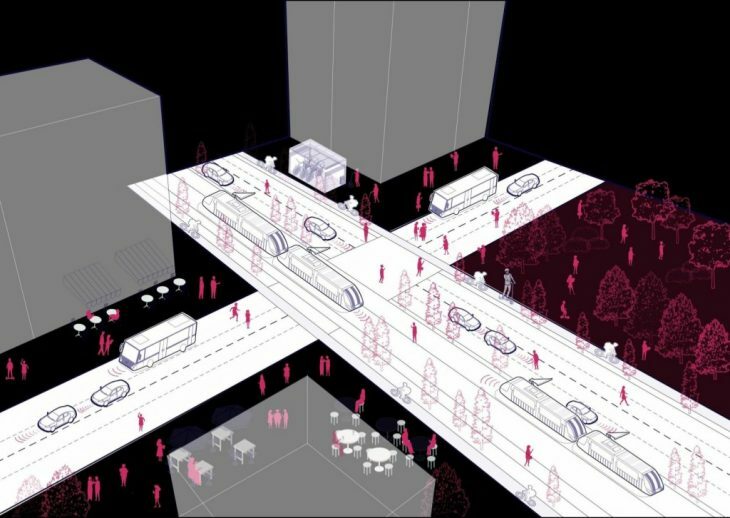 With automated cars now function as platoons able to attach and detach from each other, the definition of certain public transportation modes will change. 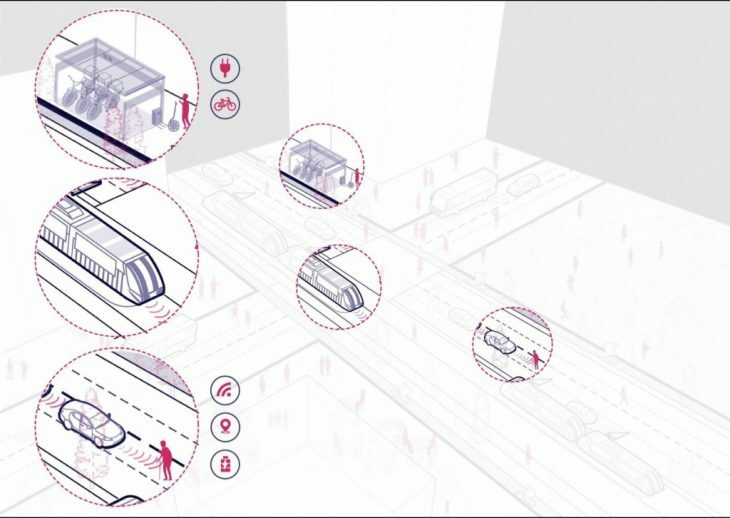 A bus will be defined as 4 shared autonomous driving cars attached to one another. The tram will become a series of 20 cars.In this way, they will detach one from the other in order to provide individuals with door to door service. Only humans see traffic signage, therefore these will become obsolete. Instead, sensors will be imbedded in the infrastructure of highways as part of a network of IOT able to understand movement patterns by pedestrians and automobiles and adjust accordingly. 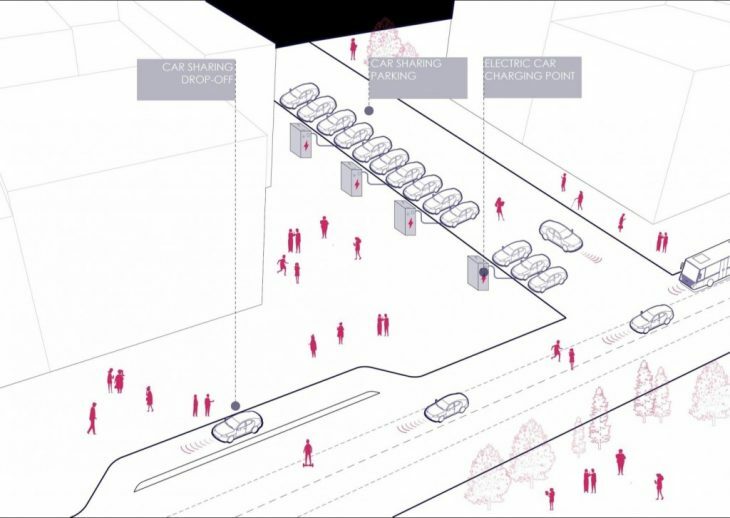 Once mobility to the outskirts has been improved, new use of spaces will emerge. Traffic flows indicate that 32% of connections into ring road from Highway B-23 are vehicular. 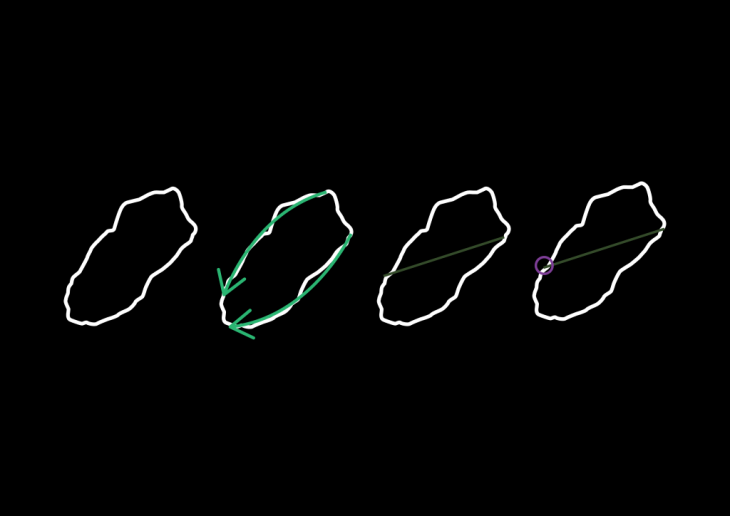 That traffic is distributed between the port and la Diagonale. It is our speculation that this is due to the concentration of offices in the city center. Understanding that in the future telecommuters will tend to live further out, there will be a need for a good public transportation leading to the center to avoid an increase in car usage. 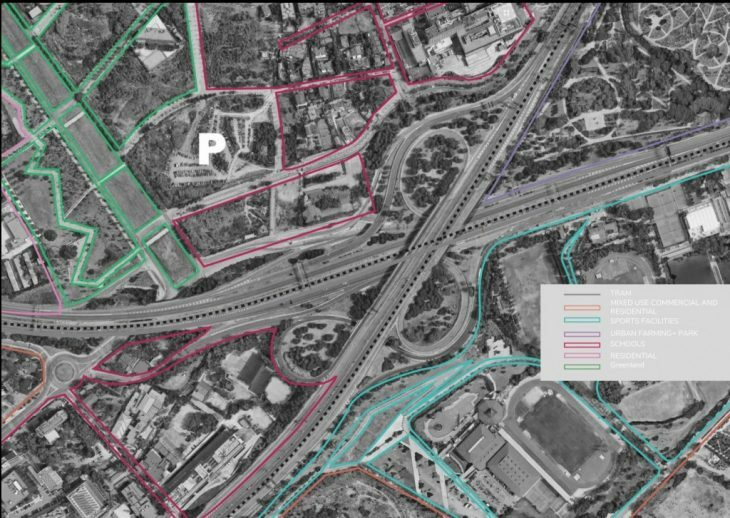 The by-product of puncturing la Ronda de Dalt to create an access into the city is a reversed improved accessibility for those living indoors to venture into the now newly activated spaces surrounding the ring road. 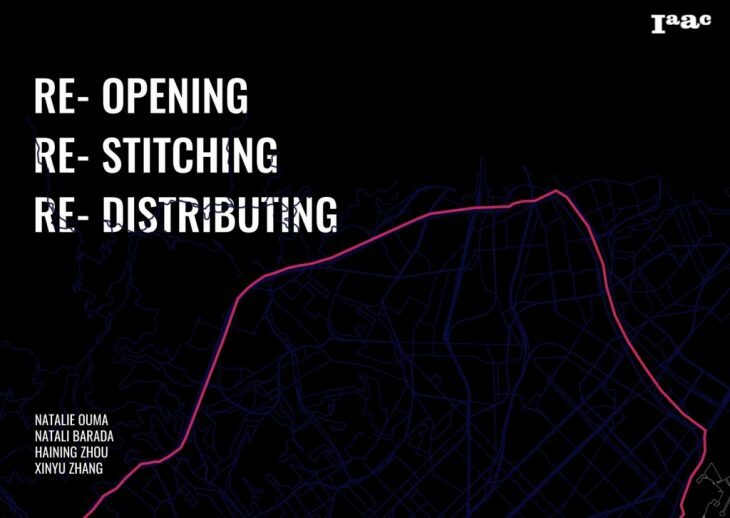 Our strategy is to reopen, re-stitch and re-distribute. La Ronda is a barrier separating the inner dense city with the scenic periphery. Though circular, it has a very strong linear axis. It is punctured by another strong axis la diagonale.at a large interchange. On a macro level, we will extend the current tram line on la diagonale up to the interchange and beyond opening up a new directional flow for public transportation outside the city. 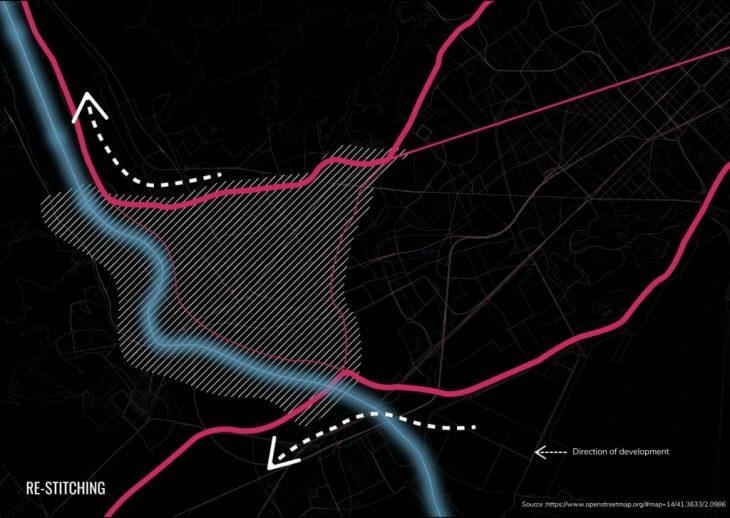 Moving towards the llobregat river, there seems to be a need for re-stitching of public transportation from La Ronda across the Llobregat river. An interesting solution would be to reimagine the riverfront with multiple bridges stiching one side to the other. Though there is clearly a need for restitching however we will be focusing on a specific node that we believe will be the catalyst city expansion. Land use on the macro scale is divided into Agriculture across the river, industrial, residential and parks East of the river. 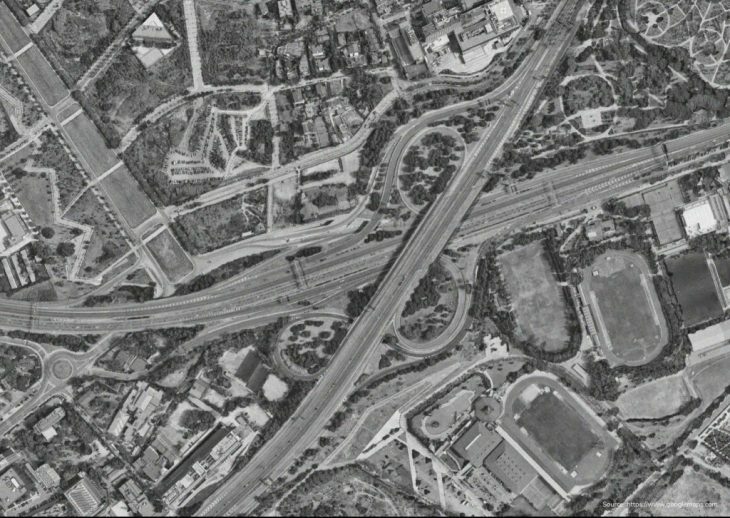 The interchange at this location is a modified Cloverstock exchange. On the top lane, there are 8 lanes plus two emergency lanes. On the bottom lane, there are 9 lanes plus 2 emergency lanes. It occupies an area of 49 blocks which is the equivalent to 5 superblocks. The land use around this area can be divided into 4 main categories: Hospitals, Sports facilities, Academic institutions and parks. 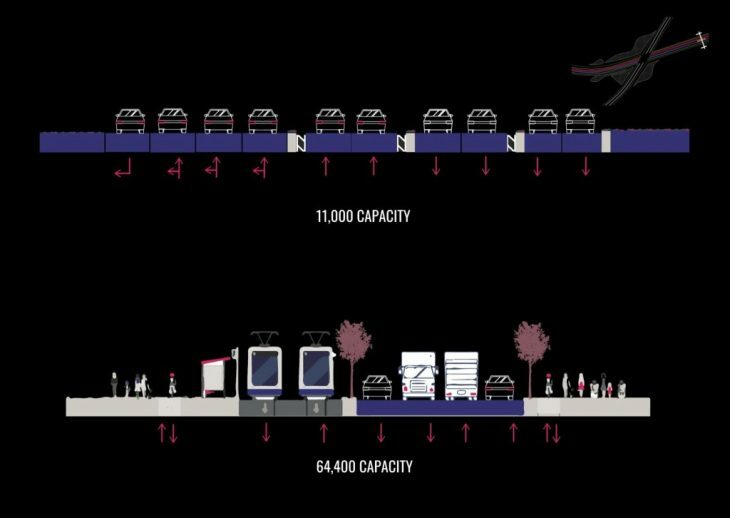 The opportunity here would be to reduce the amount of cars by improving public transportation. 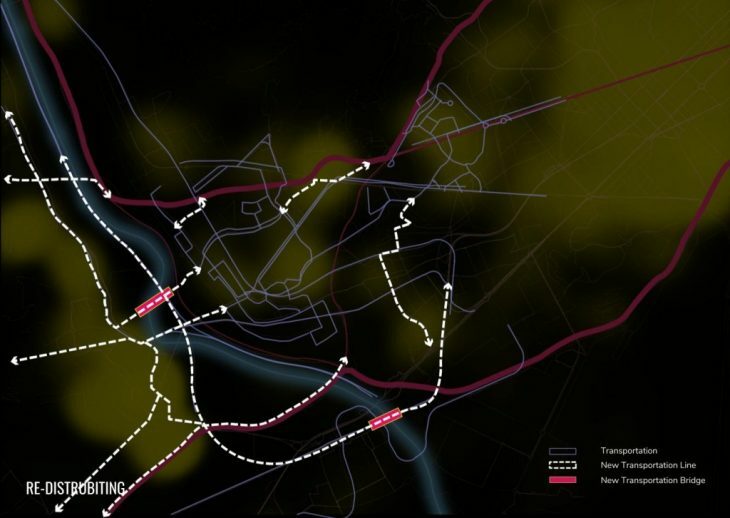 With better public transportation this will lead to a join two neighborhoods, activate a key gate into the city through the creation of a transit hub allowing for eco-mobility and diversify the land use to include more commercial spaces and offices. These new land uses will serve the population now living out of the densely populated inner ring road. 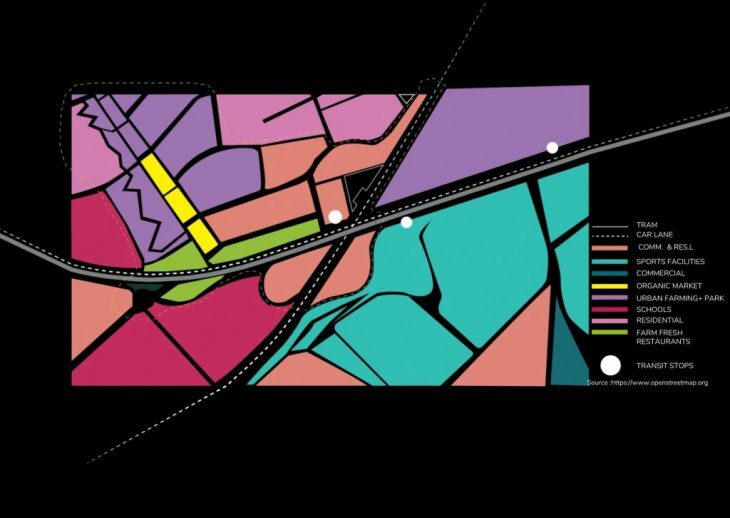 Barcelona´s vision is one of a hyperconnected neighborhood at human scale. How might we adapt the interchange model to fit a future with new telecommuter behavior? We will be focusing on how the interchange will change in morphology. From an interchange to an inter-change. 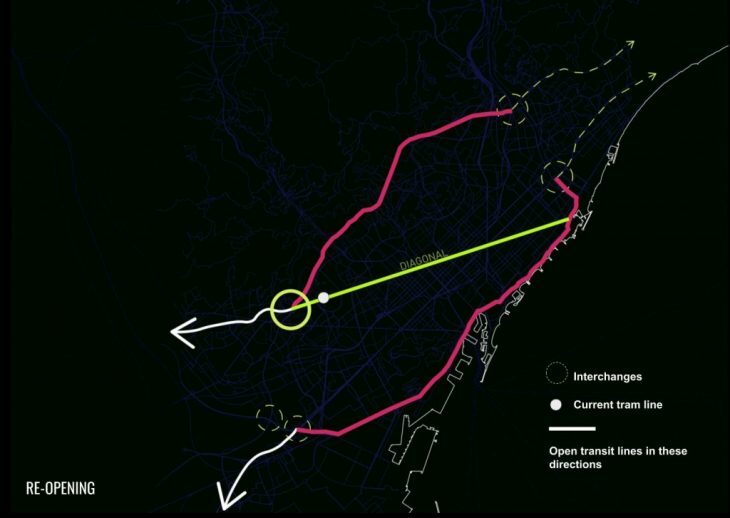 The vision for the interchange is ecomobility and an activate a key gate into the city. On a neighborhood scale, the interchange will be flattened into an x intersection in order to minimize footprint. La Ronda de Dalt will be shrunk into a 2 by 2 lane in opposite directions. 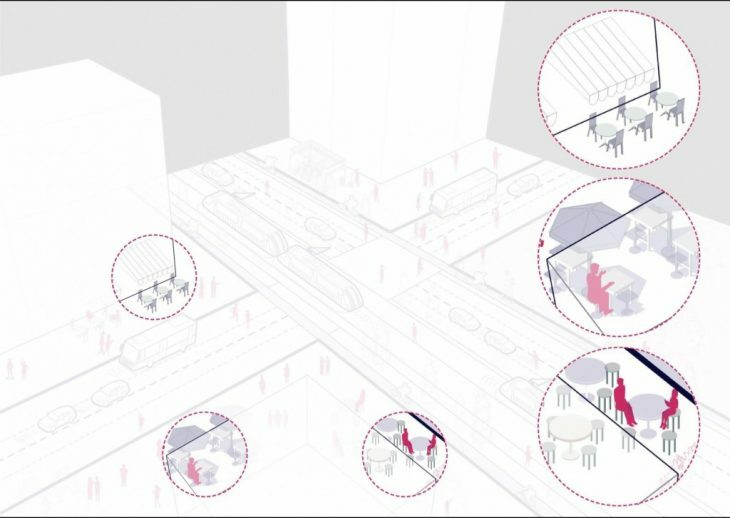 At the intersection, of La Diagonale, La Ronda and Highway B-23 we will be creating a transit hub allowing a change in public transportation appropriate for the selected distance of travel (bike, personal electric vehicles or last mile automated vehicles). By introducing a tram line we will be reducing the number of street. On top of this we will be adding bicycle lanes connecting the areas nearby and a personal electric vehicle charging station. Pedestrians will be a priority because the vehicles to infrastructure technology will allow for vehicles to re-adjust according to pedestrian flows. There will be drop off lanes for the new plattons of cars detatching from others to drop of users. Car sharing parking spaces also doubling as wireless charging for electic vehicles. The spaces previously occupied by the interchange will be turned into a mixed use commercial and office space to serve a now major transit hub. Surrounding it, the green fields currently unoccupied will become urban farming serving the residential communities around and a new organic market. Along the highway, there will be farm fresh restaurants served by these new urban farms.